If you have any queries about the Bolton 10K, please first check the FAQs below. Some Frequently Asked Questions are answered below. Q: Can I enter as part of a large group? A: Yes – If there is a large group of you, perhaps fundraising for a charity, entering individually may incur extra costs through postage and/or online processing fees. As all runners must submit their relevant details (and signatures if using the entry form), it may be easier and cheaper to appoint someone to act as the group ‘coordinator’. They can then collect your group’s completed forms and post them in bulk to the race address on the entry form. A single cheque in lieu of the group’s fees is acceptable. Q: I enclosed a Self Addressed Envelope (SAE) with my postal entry but haven’t received it back yet. Will it be sent soon? A: Running numbers and timing chips can only be picked up at Registration from 8am. Event information, venue directions and useful maps are on this website, so we have no ‘details’ as such to send out. SAEs will be returned to the senders at Registration. Q: I have entered but haven’t received any details. What should I do? A: Emails confirming entry, running number and other information are usually sent out in batches of 10. Depending on your mode of entry, it can sometimes take a fortnight to confirm. Nothing is sent out by post. If you entered online with someone else, it is possible your details have been sent to their email address. Perhaps check your junkmail in case it has been directed there. If you entered by post, it may have delayed in getting to us due to the wrong postage on (oversize) envelopes or alternatively, your email address may have been transferred erroneously. Either way, you can check your assigned running number on the CURRENT ENTRANTS page. The date of its most recent editing is indicated – all entries received at this point are listed. Q: Some of my details listed on the ENTRANTS page and confirmation email are not correct. Does this matter? A: Yes. Category results are affected by age on race day, whilst the team prizes can be affected by different spellings/shortenings of club names, however slight. Please notify us if there is an error in your assigned age, UKA affiliated club (or that of a teammate), name and gender…well, input mistakes do occur!! Q: What is an Affiliated Running Club? A: Affiliated Running Club refers to clubs that are affiliated to UK Athletics via regional/national bodies (e.g. England Athletics). Membership of gym clubs, fitness clubs, social clubs, other sporting clubs or informal running groups does not count unless it is ‘affiliated’. The list of all clubs in England that have paid up membership fees is listed HERE in PDF form (updated monthly). If your club is not on here, it is not affiliated, so you are not eligible for the £2 discount on the entry fee. Q: Can I raise funds for charity? A: Yes. Participants in the Bolton 10K are welcome to fundraise for registered charities. 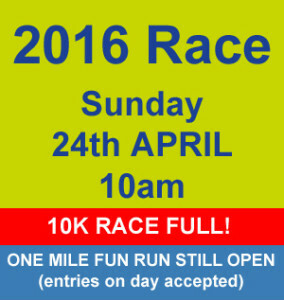 Please note the conditions of entry regarding the course being ‘run’ without ‘props’ etc. though. B10K/BUH&AC will have no involvement in the organisation of sponsorship or related matters, and whilst the value of such activities is recognised and supported, we are unable to make a contribution (e.g. in lieu of entry fees). The local daily newspaper, The Bolton News, might be interested in your story for its coverage, so please feel free to contact them for publicity. Q: The website indicates the race is full. Can I still enter? A: No. Race entries have been live for over 6 months, so if the ‘FULL’ sign is up (like this example from 2016), it is for a reason – sorry! Please try to enter earlier next year to secure your place. Please also note that there is NO ENTRY ON THE DAY, so please do not travel in the hope of taking someone else’s place. Before contacting us, please check the website’s various sections first – the info is quite extensive! If you still cannot find the answer to your query, contact us by using the form widget at the bottom of this page. Alternatively, our email address is shown in black lettering on the image below. Between January and May, we will endeavour to respond within 48 hours, though please bear in mind, the week prior to the race is very busy! Outside of this ‘race window’, we usually check once per week.